Enbridge is a Canadian company that owns and operates several large crude-oil pipelines located in the United States and Canada. The opposition to existing and proposed pipelines is building alliances across international borders, and between Indigenous peoples and their allies. The five pipelines that will be a focus of this study are Line 3, and its replacement named Sandpiper (A.K.A. Alberta Clipper), Line 5, Line 13, and the Northern Gateway Project. These pipelines affect the lives of the members of the Anishinaabeg (Ojibwe) in the Great Lakes region and Tsilhqot’in on the West Coast of Canada. The White Earth Reservation is in northeastern Minnesota. The White Earth Band has protected its ancient rice beds, hunting, and fishing rights established in the Treaty of 1837. It is within a group included in six different bands of Chippewa, also known as Ojibwe or Anishinaabe. The six bands began taking more legal responsibilities of their lands using treaty rights after Enbridge encroached on their treaty territory and have attempted to abandon projects (Glawe). “Line 3 was built in 1961 and now has significant structural problems. Enbridge estimates over 900 integrity ‘anomalies’ in the pipeline, and is operating the line at reduced pressures. But instead of fixing or removing it, they want simply to walk away, and unfortunately there is no federal or state regulation to prevent tribes and landowners from the extreme financial and ecological liability this poses. The Minnesota Public Utilities Commission (PUC), has the power and responsibility to regulate abandonment, but because line 3 is the first oil pipeline to be abandoned in the state, there is a risk that the PUC will avoid its responsibility and set dangerous precedent. We think Enbridge should clean up its mess, and put Minnesotans to work doing it” (Honor the Earth). An Honor the Earth fact sheet focuses on the Line 3 pipeline and the proposed Line 4. 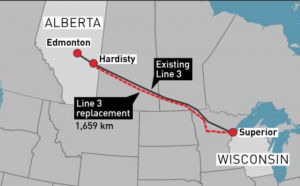 The fact sheet clarifies that the existing Line 3, which begins in Edmonton, Alberta and ends in Superior, Wisconsin, will not be fixed or removed to make way for Line 4. The Sandpiper pipeline is a complete replacement and an excuse for Enbridge Inc. to abandon the existing pipeline. The anomalies on the Line 3 has resulted in spills that go unrecorded by Enbridge in its brochures, statistics and on its website. The decision of whether the pipeline will be built or not relies heavily on the Minnesota P.U.C. If the argument for need of employment opportunities arises, Honor the Earth suggests that Enbridge should put Minnesotans, who presumably support the pipeline, to work on deconstruction of the Line 3. 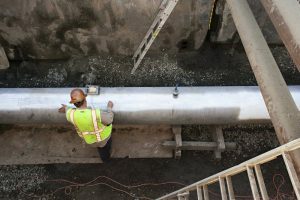 “But first it needs two things: a certificate of need from the Minnesota Public Utilities Commission, which it obtained earlier this month, and a route permit, which the commission has not decided on yet” (Ahtone). The P.U.C. had not decided on the route permit because of confusion and misunderstandings around the access to lands within state and federal laws (Glawe). Enbridge was able to construct parts of the pipeline on ‘private lands’ that are on the reservation but owned by locals. The pipeline is also called the Alberta Clipper, and would go through three Native American reservations, as well as the Northern Divide, the Mississippi River, the Chippewa National Forest, and Leech Lake (Crittenden). The Sandpiper/Alberta Clipper project would transport 796,000 barrels per day of crude oil and liquids, and transport Alberta tar sands oil through 1,098 miles of pipeline crossing through Alberta, Saskatchewan, Manitoba, Minnesota, ending in Superior, Wisconsin (Enbridge). “Partly as a result of that situation, Enbridge was able to put pipes in the ground on White Earth land. The same goes for the Red Lake Indian Reservation, where some members of that tribe have a similar discrepancy with Enbridge. Protesters there set up a camp in the winter of 2012-13 and, despite ground frozen by the sub-zero temperatures of brutal northern Minnesota winter, gave a nice, big middle finger to Enbridge by building a fence above the pipeline. It was a direct violation of the company’s policy, and a philosophical gesture in support of Indian rights. Thankfully, someone had the forethought to document the act of frigid disobedience” (Glawe). For centuries, the White Earth Reservation has depended on ancient wild rice beds for culture and food. It is a symbol of their perseverance through all of the fighting for their original territory. Not only is this a violation of long-held treaty rights, it is a threat to the Anishinaabe way of life. The White Earth Reservation invoked 1837 treaty rights on the land which led the P.U.C. to disallow Enbridge from constructing the pipeline. The Indian Country Today Media Network reports that the Enbridge projects are showing weakness in the face of tribal resistance. “’I would imagine this lake has been riced on for the last two or three thousand years, at least,’ said the elder Thompson. ‘It’s just a part of our identity.’ But those ancient rice beds face an unsure future: The proposed $2.6 billion Sandpiper crude oil pipeline, if built, will carry petroleum from the Bakken oilfields in North Dakota through Minnesota to refineries in Wisconsin, cutting through the heart of the White Earth Nation’s wild rice beds” (Ahtone). Enbridge was receiving opposition from all along the four-state route (ICTMN Staff). The company cancelled the proposed Sandpiper pipeline in 2016 and bought a 28% interest in the Dakota Access Pipeline (LaDuke 2011). The Dakota Access Pipeline at Standing Rock has been the most widely known pipeline controversy in the U.S. along with the Keystone XL (See Standing Rock, Keystone XL). And Enbridge can now use the resources to protect the desired land with militia-type forces and riot gear. However, Enbridge switching from one project to another shows great fear because it lost a pipeline connection. “’We are grateful for this victory against the black snake that threatened our water, wild rice, and way of life as Ojibwe people,’ said Winona LaDuke, founder of the conservation group Honor the Earth, in a statement when Enbridge dropped the Sandpiper line. ‘We call this land Anishinaabe Akiing. This is the land we belong to, and we will continue to protect it, as our ancestors did before us. We stand united against the proposed Line 3 pipeline, Dakota Access, and any new fossil fuel infrastructure anywhere. Our resistance will only continue to grow” (ICTMN Staff). Winona LaDuke emphasizes the urgency of pipeline opponents to unite together to fight off Enbridge. She invites the idea of cooperation among everyone who would be affected. That would apply to everyone born on Earth and the future generations. She founded Honor the Earth and the White Earth Land Recovery Project to fight for treaty rights and tribal environmental and economic sustainability. According to the Oil & Water Don’t Mix website, 14 different Indigenous communities are speaking out against the Enbridge Line 5 by adopting resolutions for the shutdown of oil flow. The list is compiled of current tribal resolutions. The resolutions state the inevitability of the pipeline risks, impacts on the environment, and the cultural effects on the people. The tribes include, but are not limited to: Mashkiziibi (Bad River) Band of Lake Superior Tribe of Chippewa Indians, Bay Mills Indian Community, two resolutions by Chippewa Ottawa Resource Authority (C.O.R.A), Grand Traverse Band of Ottawa and Chippewa Indians, Lac Vieux Desert Band of Lake Superior Chippewa Indians, Little River Band of Ottawa Indians, Little Traverse Bay Bands of Odawa Indians, Midwest Alliance of Sovereign Tribes, Match-E-Be-Nash-She-Wish Band of Pottawatomi Indians, National Congress of Indians (NCAI), Nottawaseppi Huron Band of the Potawatomi Indians, Saginaw Chippewa Indian Tribe, Sault Ste. Marie Tribe of Chippewa Indians, and United Tribes of Michigan. 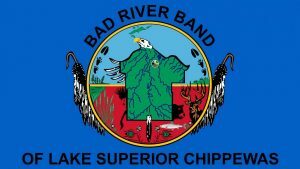 Bay Mills is in the Upper Peninsula of Michigan on the edge of Lake Superior, and the Bad River Band of Lake Superior Chippewas is located on the south side of Lake Superior in Wisconsin. “‘The Grand Traverse Band of Ottawa and Chippewa Indians’ has objected to a deal that calls for Enbridge to pay a $61 million fine for its 2010 Michigan oil spill and spend $110 million on safety upgrades across its North American pipeline network.” (Hasemyer). The spill in Kalamazoo River near Lake Michigan, was about 800,000-840,000 gallons in size (McDermott). The spill killed fish and birds that were trapped in the oil. Fish washed ashore dead and Canadian geese were found coated in oil. Other animals in the local ecology suffered the consequences. Enbridge is willing to clean up the mess, but not planning to study the cause of the spill or fix it. The rejection of this project gives a message to Enbridge that the people living on the project land will not stand for just monetary compensation. Also, this shows that the tribes require consultation before projects are built on treaty-ceded territory. Line 5 is an existing pipeline that transports light crude oil, light synthetic crude oil, and natural gas liquids from a terminal at Superior, Wisconsin to Sarnia, Ontario. It goes through the Mackinac Strait and along the northern side of Lake Michigan. It is 645 miles long and carries 540,000 barrels a day (Enbridge). “This pipeline has been in operation since 1953, and has become increasingly controversial due to its age, Enbridge’s safety record, and the fact that Enbridge has not complied with its requirements to maintain structural supports for the pipeline on the bottom of the Straits. The State of Michigan has been reviewing the pipeline for the past several years, as a number of citizens and groups have called for it to be shut down. A number of Indian tribes have expressed concern about the pipeline, and its potential impact on the Great Lakes and the tribal fishery. NCAI has adopted a resolution in opposition to the Line 5 pipeline” (Newland). Bryan Newland, the report’s author, is the Chief Judge of the Bay Mills Indian Community Justice Center and wrote about the Line 5 pipeline (Bay Mills) including, the threats it poses to the people who depend on commercial fishing, cultural, and economic resources. The Southern Lights Line is 1,588 mile pipeline that would transport 180,000 barrels of diluent bitumen oil per day. It begins in Edmonton, Alberta and ends in Manhattan, Illinois. The Red Lake Band of Chippewa Reservation is located in the Northwestern corner of Minnesota. The pipeline was completed in 2009 (Indigenous Environmental Network). A group of water protectors from the Red Lake Band decided to build a fence, which is considered a permanent structure, on the land that the illegal Enbridge oil pipelines were built on. If the fence is a permanent structure, Enbridge will have to deconstruct the Line 13 to comply with local and state laws. The Enbridge Northern Gateway Project is proposed for liquid crude oil to be transported 731 miles from Bruderheim, Alberta to Kitimat, British Columbia on the coast (Enbridge). It would transport 500,000 gallons of diluted tar sands, or bitumen (Drugmand). The Tsilhqot’in took Enbridge to the Supreme Court of Canada to cancel the project and respect aboriginal rights given by the Crown. The Court’s 2014 sided with Tsilhqo’tin and the ruling also granted the First Nation title to a 1,700-square-kilometre area of traditional land outside its reserve (Hildebrandt). “For centuries the Tsilhqot’in Nation, a semi-nomadic grouping of six bands sharing common culture and history, have lived in a remote valley bounded by rivers and mountains in central British Columbia. It is one of hundreds of indigenous groups in B.C. 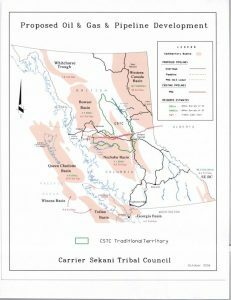 with unresolved land claims… Talks with the Province reached an impasse and the original land claim was amended to include a claim for Aboriginal title to the land on behalf of all Tsilhqot’ people. The federal and provincial governments opposed the title claim” (Supreme Court of Canada). The aborignial land claims were originally rejected in 1983. The trial judge, after doing research, found evidence of significant land use of the Tsilhqot’in Nation land (Supreme Court of Canada). “’There are so many points of entry in the opposition, from people concerned about climate impacts to locals who don’t want to see their coastlines tarnished,’ said Nikki Skuce of ForestEthics. ‘With such a strong wall of opposition in British Columbia, this pipeline will never be built’” (Drugmand). The court case created a way to ‘measure’ the amount of activity that an Indigenous group must utilize on land in order to claim the rights. The activities in this case were that of cultural and economic significance to the first nation. A pipeline that would degrade the land with numerous spills and water contaminations would ruin the cultural identity of the people if a connection to land is lost for first nation citizens. Another part of the decision specified that the non-native local people do not have to experience spills and water contaminations alongside the First Nation. Tsilhqo’tin and its allies celebrated the unprecedented Supreme Court victory. “Two down. Two to go. That’s the new rallying cry of pipeline foes after the Federal Court of Appeal overturned approval last week of Enbridge’s 1,177-kilometre Northern Gateway pipeline project through northern BC. Eight First Nations, four environmental groups and the country’s largest private sector union, Unifor, launched a joint case against the controversial pipeline last fall after the project had been given a conditional green light by the Harper government. One of the conditions of that approval was that Enbridge conduct meaningful consultations with affected First Nations” (Vasil). Eight First Nations, four environmental groups, and the largest private sector in Canada, Unifor, then came together to file a lawsuit against the Northern Gateway Pipeline. One major demand is that Enbridge must consult with all of the affected First Nations. The Canadian court case was a huge step forward for the Earth and the future. It shows that through hard work, determination, and allies that the battle against Enbridge is in the near future. The United States should consider the court cases of Canada to really cross international borders and set up more alliances that could truly benefit the health of the Earth. “A poll conducted in 2010 found that 50% of Canadian citizens believe the risks involved with tar sands projects outweighed the benefits. Yet tar sands expansion continues. Already the Athabasca Delta has been completely altered from a pristine boreal forest, clean rivers and lakes to a devastated ecosystem of deforestation, open pit mines and watershed where fish regularly exhibit tumors and birds landing on contaminated tailings ponds die instantly” (Indigenous Environmental Network). The Indigenous Environmental Network shares the effects on the ecosystem in lands of industrial oil development. The people that live on the land have rejected the idea of giving up their healthy hunting and fishing practices. Other Canadian citizens also have a problem with supporting megaprojects because the benefits are lacking in comparison to the risks and the environmental hazards on the wildlife and human health. Cooperation can ultimately end pipelines as a threat. There are many pipeline projects (existing and proposed) that are seeing resistance from Native and non-Native people. The most important to consider, for the health of the Earth and people, is the Indigenous cooperation that threatens the oil industry from the bottom up. The active participation in rejecting the pipelines, builds alliances among groups of Indigenous Nation members and the non-Native neighbors that will be inevitably be affected by the potential for spills, explosions, and water contamination. By showing this amount of resistance to energy giants, the Indigenous nations are standing up for the last natural resources of the Earth that need to be seen as sacred and untouched. Ahtone, T. (2015, June 24). Minnesota tribe invokes treaty rights in fight to stop pipeline. Al Jazeera. Crittenden, G. (2014, November 20). Lawsuit over Enbridge oil sands Alberta Clipper pipeline. Hasmatmag. Democracy Now. (2016, August 23). Native Activist Winona LaDuke: Pipeline Company Enbridge Has No Right to Destory Our Future. Democracy Now. Enbridge. (2017, February 2). Enbridge Line 5 brochure. Enbridge. (2017). Enbridge Interactive Map. Glawe, J. (2015, February 2). The Pipeline Fight Pitting Native Americans Against Big Oil. The Daily Beast. Hasemyer, D. (2016, September 13). Michigan Tribe Aims to Block Enbridge Pipeline Spill Settlement. Inside Climate News. Honor the Earth. (2017, February 20). Enbridge Line 3 factsheet. ICMN Staff. (2016, September 4). Manoomin Win: Enbridge Inc. Officially Shelves Sandpiper Pipeline; Ojibwe Wild Rice Waters Safe. Indian Country Media Network. LaDuke, W. (2017, January 9). Enbridge Round Two with Tanks? The Circle News. Matheny K. (2015, October 10). Where does the Line 5 oil pipeline go from here? Detroit Free Press. McDermott, M. (2010, July 28). 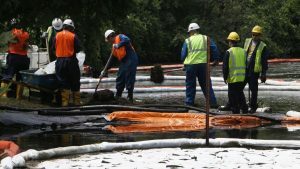 Up To 1 Million Gallons of Oil Leak Into Michigan River From Pipeline – Largest in Midwest History (UPDATED). Treehugger. Nadleh Whut’en First Nation Staff. (n.d.). Projects. Nadleh Whut’en First Nation. Newland, B. (2016, September 19). 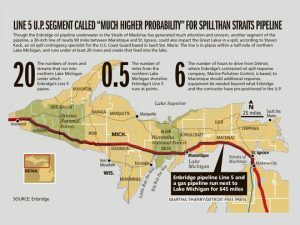 Enbridge pipeline litigation, and its (potential) impact on tribal treaty rights in the Great Lakes. Turtle Talk. Newland, B.(n.d. ).Election 2013. Bay Mills SCC Cases .(n.d.). Tsilhqot’in Nation v. British Columbia. Oil and Water don’t Mix Staff. (n.d.). The Problem. Oil and Water don’t Mix. Vasil, A. (2016, July 5).Ignoring First Nations concerns costs Enbridge Northern Gateway pipeline. Warrior Publications. Lexum.